Interest in the study of deindustrialisation has grown substantially in the last number of years. Postgraduate researchers, ECRs, senior academics, heritage organisations, community activists, and others are engaged in understanding the ways in which socio-economic transformation has impacted working-class communities. However, this increase in interest comes with drawbacks and limitations. For me, a key one is the lack of communication across different groups, sectors, and geographies conducting similar research. The aim of the network is to foster stronger connections between the wide range of groups and individuals researching the multifaceted impacts of deindustrialisation in Britain. I was delighted that the first workshop was representative of these synergies and diversities, both in terms of papers presented and the delegates that attended. Below is a short report from the first workshop. Our second workshop will be held at Newcastle University on Friday November 30th – please email deindustrial@newcastle.ac.uk to join our mailing list and receive updates on all events and activities. Reflective of the diversity of interest in the area, the workshop kicked off with a fascinating creative arts project. Dr Silvia Loeffler, an artist based in Dublin, discussed her deep mapping work in Dun Laoghaire Harbour. Silvia began with an engaging practical session, encouraging delegates to map out their route from ‘home’ to the workshop, provoking interesting conversations regarding the meanings of home and place. She then discussed the process of working with those connected with the harbour – a very diverse and fragmented community – to understand the different meanings of the space and to visually map these connections, and the conflicts in re-purposing of the harbour for tourism and service sector industries. The next session was presented by Sarah Christie from West Dunbartonshire Council, and Chris Cassells from the University of Glasgow’s Business Archives, formerly Sarah’s colleague at WDC. They spoke about the #SingerStories project launched by the Council in September 2017. 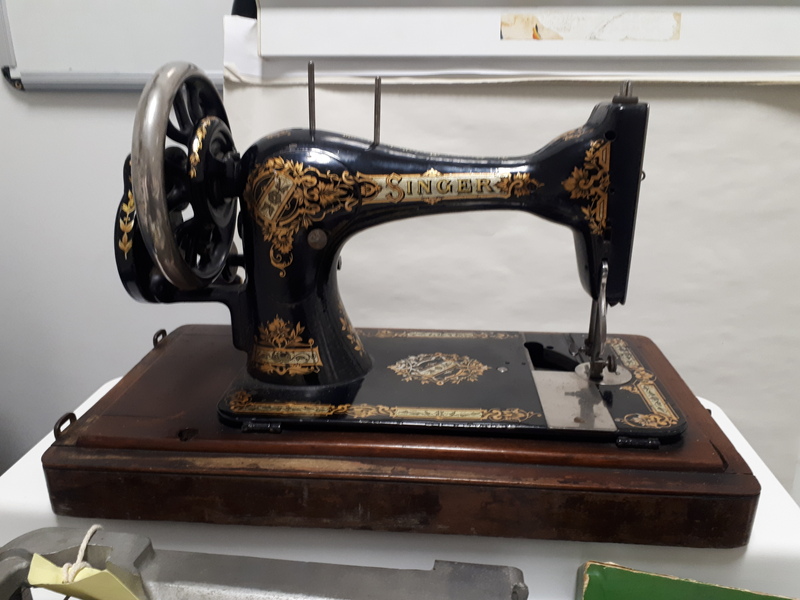 The project focuses on the former Singer Sewing Machine Factory which dominated the town of Clydebank throughout the 20th century, employing over 15,000 at its peak before closing in 1980. Sarah led the discussion on the practicalities of managing a collection as vast as the Singer materials, and using the objects to engage with the local community. She demonstrated the reminiscence kit that has been taken to care homes and other places to encourage discussion and conversation with the community whose lives were shaped by the Singer plant. Chris then presented a thought provoking paper on his reflections of working with volunteer oral historians, the process of collecting interviews, and an analysis of the ways in which interviewees interacted with the process. Of particular importance in broader oral history debates within deindustrialisation was the importance of a shared narrative among those who worked in the factory, and the methods used to interrogate beyond nostalgia in considering working lives in the plant before closure. Following a break for lunch, Paul Sweeney, a lifelong community heritage activist and now Labour and Co-Operative MP for Glasgow North East, discussed the attempts by the Fairfield Heritage Centre to capture – and display – a century of disruptive change in shipbuilding on the River Clyde. He talked through the growth of Britain’s first super-yard, with an extensive outline of the technological changes that impacted shipbuilding on the Clyde. Paul brought this right up-to-date, with a discussion of the works being carried out by the current occupier of the site, BAE Systems, and the possibilities for future expansion. He concluded by reflecting on the community’s efforts to save and preserve the Fairfield Office, a listed building that now hosts the Heritage Centre (for more information regarding restoration, see this video). Paul’s paper was a perfect bridge in considering how we interact with former industrial sites and how they can be re-imagined through sensitive heritage projects and a strategy of re-industrialisation. The penultimate session focused on deindustrialisation and the school curriculum, with two papers presented based on recent projects. 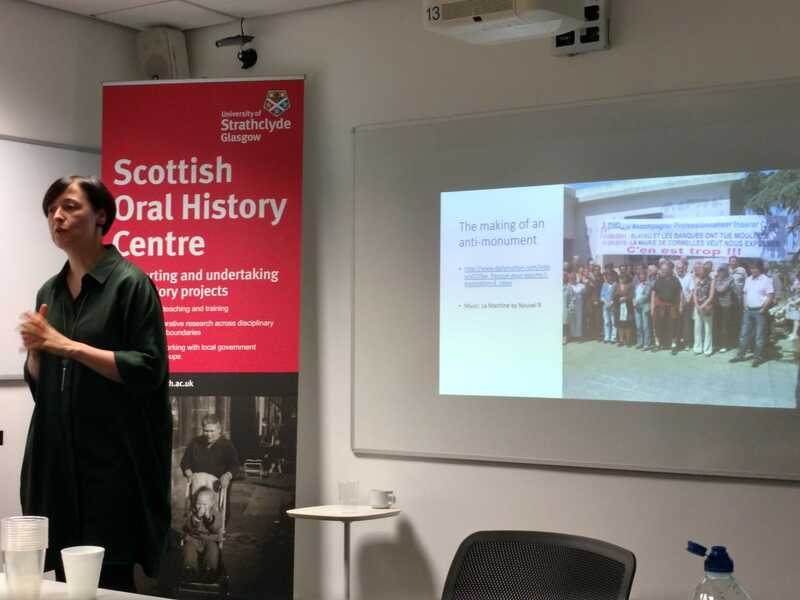 Ewan Gibbs presented findings from a recent project (PI Susan Henderson) with high school pupils looking at the occupation of the Caterpillar plant in Uddingston in 1987. Adopting a place-based learning approach, Ewan considered the generational gap between school pupils and the industrial past and argued that there has been an erasure of the occupation – and the factory – by both Caterpillar and new housing developers. This opens up important questions regarding whose history is being told, and learnt, in areas impacted by manufacturing closure. Following Ewan’s paper, I presented my reflections on an oral history project I conducted with pupils of Springburn Academy, 2013-2016. The project also utilised a place-based learning approach, and focused on the long-term impacts of manufacturing closure and botched urban ‘development’ on the area. I argued that the impacts of deindustrialisation should be incorporated in the school curriculum to educate those living in the half-life of deindustrialisation on the lived history of their communities. I also argued that oral history should be a central component of this, as narratives of structural violence illuminate experiences more vividly for younger people than other methods of investigation. The workshop concluded with an invigorating keynote lecture from Dr Jackie Clarke. Jackie considered the key questions regarding uses of factory sites post-closure. In analysing the former Moulinex factory site in Cormelles-le-Royal, she posited the question of who ‘owns’ the physical factory space, and who owns the memories of the space. The case study drew on interviews with Workers Associations and an interrogation of civic attempts at memorialisation. She argued that monument efforts with no engagement with former workers create a distancing and erasure of the experiences of those who occupied the space. Issues such as the type of work – and the type of product – being memorialised through ‘consumer heritage’ reinforces ideas of memory without labour and without struggle. Additionally, the Workers’ Association created their own mural to the factory, adjacent to the civic monument, which Jackie asserted was an act of ‘taking back agency, not victimhood’. Jackie Clarke’s keynote lecture – and the discussion that followed – was the perfect conclusion to the workshop. It brought forward ideas of memory, relationships with place, the erasure and distancing of the industrial past, and the (mis)uses of heritage sites that had threaded through the preceding conversations among academics, artists and heritage organisations. The second workshop will develop these themes and continue conversations among academics and non-academic researchers, and stakeholders with an interest in the lived experience of working-class communities in the last four decades. As above, please email deindustrial@newcastle.ac.uk for further information!